The Musketaquid Arts and Environment Program of the Umbrella Community Arts Center hosts an Earth Day celebration on April 28, 2018 (rain date April 29). This vibrant town event is a celebration that brings awareness of local and national environmental issues. The theme for this year’s celebration is “Gathering Places”. This free, four-part celebration welcomes and encourages public participation. For more information, visit http://theumbrellaarts.org or contact Nancy Lippe at nancy@theumbrellaarts.org. Earth Day Parade: 10:30 – 11:30 am The event kicks off at the Umbrella Community Arts Center on Stow Street where participants gather for a parade down Main Street. All are welcome to join in. Participants may bring their own puppets and banners or pick up one of the large puppets available in front of The Umbrella. The parade with banners, flags, and beautiful giant puppets which depict local plant and animal wildlife bring color and life to the streets of Concord. Professional musical and dancing groups aNova Brazil, Dirty Water Brass Band, and Diabolis In Musica entertain the community and join the parade. 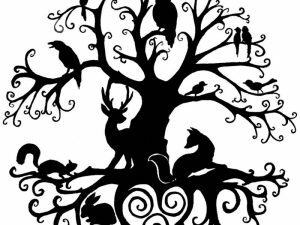 Earth Day Festival: Noon – 2:00 pm The merriment continues with a Festival on the grounds of the historic Old Manse, a Trustees of the Reservations property. The entertainment includes several performances. Eric Bornstein’s Behind The Mask Theater presents “The Woman Who Outshone the Sun”, an allegorical play that combines masks, music, dance and storytelling to create a dazzling theatrical experience. A contemporary dance performance by the Jody Weber Dance Company engages the public in the expressive power of movement with excerpts from “Her Sylvan Ascent”. Mass Audubon Society’s Drumlin Farm offers a live presentation on Birds of Prey. There will be activities for children including kite building and spoon making, non-profit exhibitors, and food vendors. The Earth Month Art Exhibit at the Umbrella Community Arts Center is a non-juried art show featuring works using a variety of media around this year’s theme “Gathering Places”. The gallery is open April 12 through May 6 daily 10:00 am to 5:00 pm. Exhibit Opening and Artists’ Reception will be held on Thursday, April 19, from 6:00-8:00pm. https://www.livingconcord.com/wp-content/uploads/2018/12/logo_living_concord-300x71.png 0 0 pollymeyer https://www.livingconcord.com/wp-content/uploads/2018/12/logo_living_concord-300x71.png pollymeyer2018-04-04 10:25:262018-04-04 10:25:26Concord-Carlisle Community Chest "Night Out for Neighbors"
Concord Recreation will be hosting its 2nd Annual Egg Hun on Friday, March 30th at the Doug White Fields at Concord Carlisle High School. This is a free community event for individuals age 2 through 2nd grade. 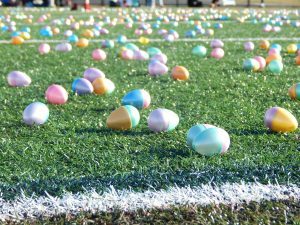 Participants will search for prize filled plastic eggs, get photos with the Easter Bunny, and more! For more info, please visit www.concordrec.com or call 978-287.1050.
politics, religion, values, life style. How do we learn to have conversations around issues that sometimes divide us? How do we learn to listen better, discuss, and even bridge that divide? We can’t believe how many people in our community entered the “Win a Valentine’s Day Dinner at Karma” contest! Tracy White is the winner! Congratulations! Thank you to everyone for entering the contest and for spreading the word about the new town calendar. We now have close to 400 members of the community who have signed up to receive our weekly email. 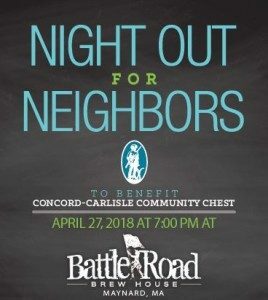 This is a community service for Concord and Carlisle – schools, sports organizations, and non-profits are all posting events to the calendar. CCHS is presenting a Parent/Student Dialogue Night on Thursday, January 18, 2018. All parents and their teens are invited to join us and discuss the issues of stress and pressure in our school community. This is an evening of student skits, honest discussion, and brainstorming ways to de-stress our students’ lives. Reserve your spot as soon as possible. 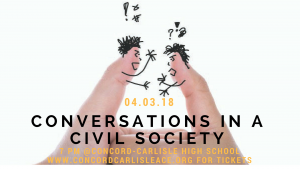 For questions regarding this event, please contact Assistant Principal Leslie Knight at lknight@concordcarlisle.org. We are very excited to offer this event to our families and hope you can join us! The Center for Parents and Teachers invite parents to hear internationally acclaimed presenter, Dr. Michael Thompson. “The Pressured Child” is, in fact, a presentation for “pressured parents” who have forgotten what school is actually like. It is a talk for parents who are gripped by worries and misapprehensions about their children’s life in school. In the presentation, Dr. Thompson describes the psychological journey that children experience during their thirteen years in school. He reminds parents that children are almost never judging themselves by grades: they are always monitoring their own development and constantly searching for three things: connection, recognition and a sense of power. He illustrates how children find those in many different arenas of school life. There are three kinds of children in school: 1) those whose journeys are characterized mostly by success, 2) those whose journeys are characterized by a chronic but manageable struggle, and 3) those whose journeys are characterized by fury and despair. Each journey has its own different pressures. Every child is constantly developing strategies for coping with the pressures that he or she feels. https://www.livingconcord.com/wp-content/uploads/2018/12/logo_living_concord-300x71.png 0 0 pollymeyer https://www.livingconcord.com/wp-content/uploads/2018/12/logo_living_concord-300x71.png pollymeyer2018-01-04 20:33:292018-01-04 20:33:29"The Pressured Child: Helping Your Child Find Success in School and Life"
This is our own Concord-Carlisle Community Events Calendar! We invite all schools, sports organizations, and local non-profits to post any upcoming events. Planning an event in May? Post it! It’s super easy to do. Click “Add Your Event” and you’ll see just how easy. You can share your event through FB and Twitter. Our main mission at Event Juggler is to spread the word! We want the local community to know about your upcoming events. We also hope that having visibility to other organization’s events will help you to optimally plan your own. Any questions? Please don’t hesitate to contact us.